Named after Georgiana Molloy, a botanist who worked in Western Australia, Boronia molloyae is a pink flowering species sometimes called the tall boronia. This particular species grows along watercourses in the coastal areas around Port Augusta. 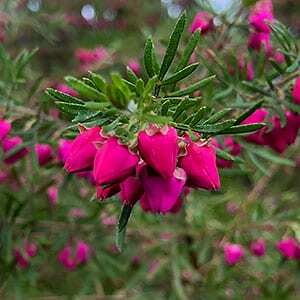 It is not widely found in cultivation as other boronia varieties as it is seen as a being a little difficult. Very attractive pink flowers are the feature of a tall growing plant that will reach to around 2 – 3 metres in height, generally shorter in cultivation. The flowers are heart shaped hanging beneath the stems and are a bright pink. The foliage is aromatic and a good mid green. Best grown in full morning sun with a little afternoon shade, this is a Boronia that requires a sandy well drained soil with a little moisture. The species itself is tall growing to around 2 – 3 metres in height however regular tip pruning after flowering will maintain a more bushy compact habit. Once planted, mulch lightly around the plant and water through dry periods over the first summer. A native plant fertiliser can be used to promote growth in poorer soils if required. Flowering time – Mid to later spring. This is not a species that is widely offered for sale in Australia at present.